Hello, my name is Seraph IX Basarab and I’m a diplomat within Psychotic Tendencies (TISHU). I’ve been a writer here at EN24 since 2011 providing critique pieces regarding politics within Eve Online. The article written is based on my personal analysis and is not the opinion held or espoused by EN24. Enjoy. So for this piece, I’m going to focus on the contents of the recent Mittani leaks and his interaction with CCP. If you haven’t been following events in Eve here’s a quick recap of key events. If you already know the background or simply don’t care, feel free to skip the next section. In late 2015 the Mittani’s media site announced that they would be promoting a kick starter campaign to write a book detailing his coalition’s (then known as the “ClusterFuckCoalition” (CFC), now self-proclaimed as the “Imperium”) campaign in Fountain. His alliance, Goonswarm Federation (GSF) played a major role in the coalition and to this day still leads the CFC. A popular backlash against them ensued over what many in the Eve community considered an exuberant price ($150,000). The CFC’s diplomat, Sion Kumitomo, released a strongly worded critique towards the Eve Reddit community essentially claiming that people were merely jealous and that “there is no Reddit Eve community.” Along with this Mittani announced the “Viceroyalty program.” This would be a military campaign the CFC would undertake against entities with the stated goal of forcing said groups to pay the CFC tribute. This campaign ultimately resulted in various low sec groups banding together and while outnumbered, manage a string of victories against CFC fleets. A dispute between IWantIsk.com an Eve themed gambling site where people can play to win in game money, and SpaceMonkey’s Alliance, (SMA) at the time the 2nd largest alliance of the CFC resulted in the former party to take military action against the latter. Starting in January, TISHU was hired to carry out a punitive campaign against SMA in the region of Fade. From January until mid March, various other groups became more and more involved in attacking not only SMA in Fade, but the entire CFC in various regions of space. SMA lost over 30% of its membership as a result. The heavy losses experienced by the CFC through this asymmetric war escalated drawing in larger alliances such as Pandemic Legion, Northern CoalitionDOT and TEST Alliance. The attackers would become known as the Money Badger Coalition (MBC). A series of one-sided defeats caused The Mittani to announce a full withdraw from the CFC’s most eastern region of Vale of the Silent. One region over in Tribute, the CFC’s most militarily competent member known as Circle-of-Two (CO2) announced they would be leaving the coalition. This prompted a series of systems and regions falling to various MBC alliances which continues today. Throughout this conflict between internet spaceships, there has also been a conflict raging across media from EN24, CZ, TMC, twitter, slack, and especially reddit. Since Sion’s article, the CFC has opted to ignore reddit completely considering it a haven for their opposition. This has led the Mittani to claim that because CCP makes announcements regarding their game on reddit, that this shows favoritism toward reddit itself. Because for the Mittani reddit = MBC, his conclusion is that CCP is therefore siding with MBC. The Mittani blames the CFC’s current losses in large part on the newer Aegis sovereignty system which had replaced the older Dominion sov mechanics. This is a complete 180 degree flip from earlier in 2015 when they fought a campaign against a smaller coalition known as “ProviBloc” where they claimed victory. In any case the current narrative from the CFC is that the current Aegis sov mechanics are bad because the CFC has to defend their space while the attackers do not have their own space which the CFC could attack. It is true that some groups currently fighting the CFC are from lowsec and do not hold sov. However, the largest groups actually do hold sov either directly or through proxy. Most of the groups that did not have sov, do so now at the expense of the CFC. In any case the Mittani ordered his media site, TMC, to push forth the name for this conflict as “The War of Sovless Aggression.” Nonetheless, the majority of people on Eve seem to have gravitated toward the more catchy “World War Bee” as a play on the fact that the GSF’s mascot is a bee. 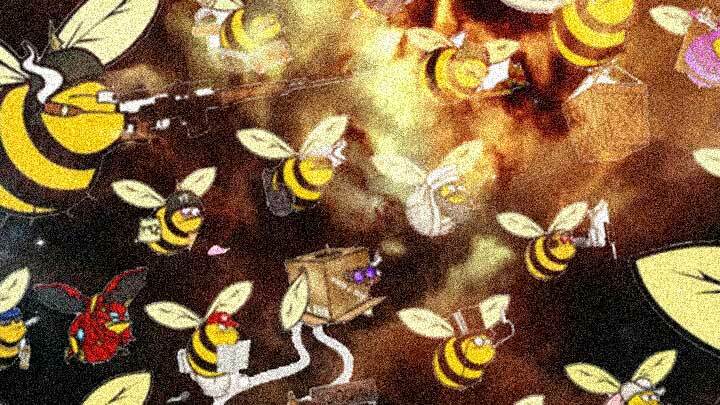 As a result to its popularity, CCP used the term “World War Bee” in one of their promotional statements. They also released two background avatars, one for MBC and the other for the CFC which had a black/yellow bee theme to it. For The Mittani this once again proved that CCP was somehow working with the MBC. He argued that the bee theme to the background not only further perpetuated the “World War Bee” name but also promoted the GSF’s presence over that of other CFC member alliances. Alex (The Mittani), you made an excellent point about the avatar backgrounds. Their inclusion in the game was ninja’d into development (a surprise to me until they went up on the Updates page) and collectively we didn’t give the proper scrutiny on the Alliance vs Coalition angle. I talked to Seagull and a few others (including the art team) following the GSF, and I believe they are working on a new one inspired by the Imperium logo at some point in the near future. We understand that CCP hopes to market this war to improve Eve Online as a whole. We remind you that members of the Imperium are paying customers, many of whom are not members of Goonswarm Federation, and CCP ignoring their struggles and identity as members of non-Goonswarm Imperium alliances has been seen as a slap in the face by the company itself. We appreciate your acknowledgment of error on the Bee-focused avatar backgrounds. Your acknowledgment thus far has only been in this private email. We think it would be wise for you to make a public statement that our members can see, as this is an issue impacting the entire Imperium, rather than something involving myself as an individual. Likewise, our members remain offended that CCP’s marketing has branded a war which has gone for four months and only recently involved Goonswarm’s space directly as “World War Bee”; the issue is identical with the error in the avatar backgrounds. When will we see a public statement from CCP acknowledging these two errors, consistent with the private acknowledgment you have now made regarding the Bee-focused avatar backgrounds? To our people – your customers – this is a critical issue which I am repeatedly asked to make statements about our position on. In the logs Mittani also states that if CCP wants he would be willing to get a reporter from International Business Times to cover the situation. Wondering if you are each ok with me passing along your email contact information to a reporter at the International Business Times. They are interested in writing an article about the war and was hoping I could help provide some interviewees. I am not sure if it will be a written or spoken interview or how expansive the article will be. I am passing along contact info for Laz, Killah Bee, Elise Randolph, and Vince Draken as well. Possibly Vily, but he has not gotten back to me. If you guys can send me contact info for anyone else in the Imperium you think would be great, like DBRB or Asher, I would appreciate it and I will approach them. As with the Vile Rat requests I would leave that decision up to you though, as always. Did you catch that? The Mittani wants to make CCP Manifest apologize for making a video game background avatar about bees and then when he does that, Mittens is going to hit him with CCP using the name “World War Bee” as well. And then have the apology publicized to CCP Manifest’s boss as well as stating that the International Business Times is “eager to print whatever I tell them.” All of this after CCP Manifest already let him know that a CFC/Imperium styled background would be made as well. That’s right, implying threats to someone’s actual job over video game backgrounds and names over pretend spaceships. As the owner of his own media site, TMC, which has worked to promote other games, such revelations are more than interesting for current and potential future business partners. Perhaps CCP Manifest is the only person Mittani would treat and threaten like this. However that’s a risk others will have to judge for themselves. As far as Eve Online goes it’s certainly possible for Mittani to get banned. CCP holds the rights to any and all in game assets including characters. Between the sharing of private e-mails, verbal abuse, and the notion that it is okay to threaten a CCP employee and by proxy, the company itself with the International Business Times, they have more than enough justification. However the Mittani doesn’t need to log in to “play Eve.” Most of what he does is from outside of the game. All this would do is essentially give Mittani a victim-hood corner he can try to play from. Let him play Eve. The CFC has offered only token resistance to the MBC in a war they are clearly losing by every single metric. However what CCP could do is simply ban Mittani from all of their events including Fanfest, Eve Vegas and anything else. Let’s not mince words here, threatening to CCP Manifest in such a way is clearly malicious and shows that Mittani is willing to go to lengths far outside the scope of the game to get his way, no matter how petty it may be. There also seems to be a consistency in Mittani’s character. Several years ago at fan-fest Mittani used his platform to goad a mob of players into harassing another player. “If you want to get this guy to kill himself…” as he put it. Don’t get me wrong. I’m completely in agreement with the “HTFU” ethos of Eve Online. TISHU infiltrated, demoralized, awoxed and ganked SMA every which way they could. Before I was with them I would attack industrialists in wormholes for ransom money. I fully support this kind of gameplay and I know CCP does too. However crossing that line by actively trying to hurt CCP as a company over an avatar background and a name because they don’t fit your narrative should carry consequences. P.S. as an afterthought…I wonder why does Mittens even want a coalition background when those logs clearly show he’s working against the stability of his own allies so he can absorb their members anyway? Someone necessarily help to make significantly articles I would state. That is the very first time I frequented your web page and thus far? I surprised with the analysis you made to create this particular publish incredible. Fantastic activity! Thank you so much for providing individuals with remarkably memorable opportunity to read in detail from this website. It’s usually very ideal and jam-packed with amusement for me personally and my office fellow workers to visit the blog a minimum of thrice a week to learn the fresh issues you will have. And definitely, I’m actually contented with your unique opinions served by you. Selected 1 facts in this article are surely the most effective we have ever had. I have been exploring for a little for any high-quality articles or blog posts on this kind of space . Exploring in Yahoo I ultimately stumbled upon this site. Studying this info So i am happy to show that I’ve a very excellent uncanny feeling I found out exactly what I needed. I most no doubt will make certain to don’t put out of your mind this site and give it a look on a relentless basis. great points altogether, you just received a new reader. What would you recommend about your put up that you made a few days in the past? Any certain? My programmer is trying to convince me to move to .net from PHP. I have always disliked the idea because of the expenses. But he’s tryiong none the less. I’ve been using Movable-type on various websites for about a year and am anxious about switching to another platform. I have heard great things about blogengine.net. Is there a way I can transfer all my wordpress posts into it? Any help would be really appreciated! I love what you guys are usually up too. This type of clever work and coverage! Keep up the very good works guys I’ve added you guys to blogroll. You completed various fine points there. I did a search on the matter and found the majority of persons will go along with with your blog. It’s the best time to make some plans for the longer term and it’s time to be happy. I’ve read this submit and if I may I wish to counsel you some interesting things or tips. Perhaps you could write subsequent articles referring to this article. I want to learn even more issues about it! I have to express thanks to you just for bailing me out of such a trouble. After surfing around through the world wide web and finding thoughts that were not helpful, I assumed my life was over. Living without the approaches to the issues you’ve solved by means of your main article is a serious case, and the ones that would have badly damaged my entire career if I hadn’t come across your blog post. Your own personal mastery and kindness in touching every item was valuable. I am not sure what I would have done if I hadn’t come upon such a point like this. I can also now look forward to my future. Thanks very much for this reliable and sensible help. I won’t hesitate to suggest your web site to anyone who will need recommendations about this matter. I do like the way you have framed this specific concern and it really does offer me a lot of fodder for thought. Nonetheless, from what I have observed, I basically hope as the actual reviews pack on that men and women stay on issue and in no way get started upon a soap box involving some other news du jour. Yet, thank you for this outstanding point and although I do not really concur with this in totality, I regard the point of view. It¡¦s really a great and useful piece of info. I¡¦m happy that you simply shared this useful info with us. Please keep us informed like this. Thanks for sharing. What are one of the most popular blog site websites in the Philippines where I can send my blog sites for others to check out? WXYNJS Thanks a bunch for sharing this with all of us you actually know what you are talking about! Bookmarked. Kindly also visit my web site =). We could have a link exchange arrangement between us! Along with everything that appears to be building inside this specific subject matter, your points of view are generally somewhat refreshing. On the other hand, I beg your pardon, but I can not subscribe to your entire plan, all be it radical none the less. It appears to everyone that your commentary are not completely rationalized and in simple fact you are yourself not even wholly certain of the argument. In any case I did enjoy looking at it. Somebody essentially help to make seriously posts I would state. This is the very first time I frequented your web page and thus far? I amazed with the research you made to create this particular publish extraordinary. Wonderful job!